Fiftyfifty Top Published in Knitty! Publishing a pattern in Knitty is a great thrill. It’s a wonderful opportunity for any knitting designer to share their vision with the vast Knitty audience. This goes double for me, since not only do I want you to try this fun pattern but also because everything we do here is about sharing new knitting ideas. The web site, the patterns and the blog are all about ways to shake up your knitting. In this case, Amy asked for a pattern that highlighted the Showy Decrease and so that’s what this does, in oh so many ways. There’s a dedicated pattern page on our web site with loads of helpful information about this pattern and the skills that make it different . . . from the detailed cast on to the raised Showy Decreases and pretty non-garter edges. 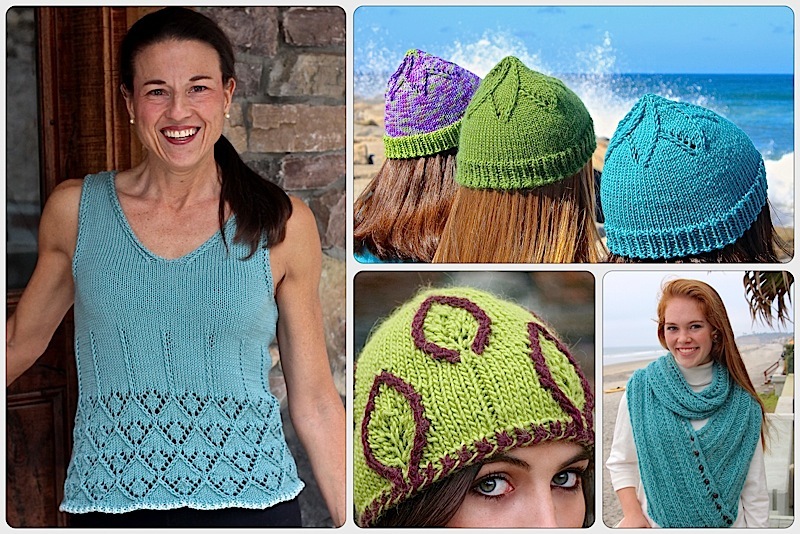 You’ll find more photos, free tutorial downloads, a Rowan yarn option and more. The fashion industry is fascinating. Deadlines for summer projects are months in advance right smack in the middle of winter and Knitty is no exception. Fortunately, I was hanging out at Lake Tahoe with my 3 sisters-in-law to celebrate the 50th birthday of my fabulous model Tina. Not so fortunately, it was 8 degrees out. That’s Fahrenheit, as in way (way) below freezing and there was a snow storm on the way. Undaunted, Tina tossed on this sleeveless top and out we went for our photo shoot. I’m not quite sure how she managed to put that lovely smile on her face (I suspect it was frozen there) or how I managed to take any pictures that were in focus with my hands shaking so badly, especially since it was too early in the day for the spiked hot chocolate we were already dreaming about. 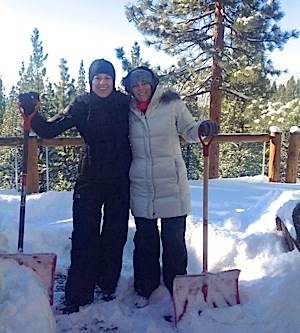 Here’s Tina (and Karen) the next morning a little more appropriately dressed. Thank you to Tina for being a trooper, to Knitty for providing this wonderful experience. Thanks guys for the nice comments. It was really fun to design. This entry was posted on March 11, 2014 by Laura Cunitz in Free Downloads, Nuances, Patterns, Showy Decrease, Tops and tagged free knitting patterns, Knitty.